Visit Yosemite Falls this Spring! Although we had a late winter in the Sierras this year, it did pack a punch in terms of snow and rain. Unfortunately that moisture translated into mud slides, washouts and floods throughout the mountains; however it also helped set the stage for spectacular spring conditions at Yosemite Falls. So I packed a picnic lunch and headed over to the park last week, to get a first-hand look at the water flow. Yosemite Falls put on a grand show for me, and with the continued warm days the melting snow pack will only add to the grandeur of it all. I expect the namesake falls to be running at full “need a raincoat at the base” conditions by mid-May. So visit the park this spring — while the falls are running, but before the summer crowds arrive. And the good news is, Yosemite Falls is one of the most accessible waterfalls in the park. The easiest way to get there is to take the free accessible park shuttle to the Lower Yosemite Fall trailhead; however if you can find a parking place at Yosemite Valley Lodge, there’s also a level path over to the trailhead. A word of warning though — do not take the trail near the lodge, as it’s too steep and not at all wheelchair-accessible. The accessible trail begins behind the shuttle bus stop and leads through the forest to the base of Lower Yosemite Fall. The paved trail is wide and level, and there are benches and interpretive plaques along the way. 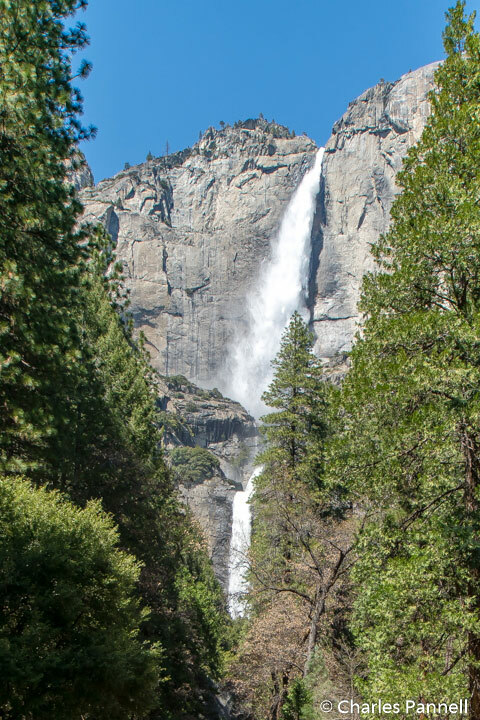 Be sure and take the short detour to the “falls view” area near the beginning of the trail, as it offers one of the best views of Yosemite Falls in in the park. Once you get to the base of the falls, you’ll be rewarded with the spray of the water, and of course more great views. The trail loops back to the main park road, but again the second section is steep and not a good choice for wheelchair-users or slow walkers. Instead you’ll have to double back, but it still makes for a nice mile-long out-and-back jaunt. And if you’d like to stop for a picnic, there’s an accessible picnic area with nearby restrooms located a short walk down the bicycle path from the shuttle bus stop. So make plans to visit Yosemite this spring — you won’t be sorry!! For more information about access in Yosemite, visit www.barrierfreeyosemite.com. This entry was posted in Uncategorized by Candy B. Harrington. Bookmark the permalink.